Home » Canine » What Color is my Dog? » What color are great pyrenees? What color are great pyrenees? I just got a great pyrenees pup, and currently he looks to be the wild type agouti and has a white pattern, I think piebald. I know that they progressively lose their color, so would that make them grey as well? Also, does he have a mask? I noticed his mother still had a lot of coloring on her head and had a very dark face while the father was pure white and they were both only around a year old. I don't think that it is wild-type agouti. I think it is a sable which would be ay. If you would like to know which, look at the colored hairs. Wild type has alternating bands of color and sable is dark at the tips. even those that "appear" all white usually have coloration in the undercoat. It was taken from a form post so I won't guarantee how accurate it is. Going with this information and the post from the above site that only "badgers" fade, I'm going to guess that they carry "gray" which only affects black pigment. The white pattern would be piebald and it does appear that your puppy has a face mask. Gray doesn't affect a face mask so if it is gray and he does have a mask he should retain it into adulthood. I hope you will document if his color changes for us? Really interesting stuff I had assumed (like I said I'd never looked into it) that Great Pyrenees were ee "cream" like white German Shepherds. I also had another great pyr and have several images of him growing up until I lost him at 3, he was very similar in coloring but did not seem to have a face mask, or had too much white on his face to show. I'll find some pictures. Heres a couple I have of my old one, he only had some color on his head and a spot on his back, which was gone by the time he was 2 or so. the pictures should be about 6wks, 14wks, 16wks, then the last one is him at 3yrs. Is grey what they have that makes them white? I noticed that in every pyr cross I've ever seen, they are very dark, but they do tend to have shorter coats. My dad just got a half pyr half shephard (not sure what kind) and she is very black and white, I would think that if they were grey that they would most likely be HZ grey so most crosses would also grey, but they do not seem to be. Well, according to this site http://bar6diamondranch.com/lgdspics.html Black and white great Pyrenees do occur so I think it's likely that It's still gray with a small percentage of dogs being heterozygous. Check out this article --> http://www.lgd.org/library/CoatColorInPy.... Seems pretty good. Here's a question. When you part the areas what were colored is there still color at the base of the hair shaft or is the entire hair shaft faded? I won't be able to tell you that with mine until he looses his color, but even in my late pyr he still had visible spots at 3, but he didn't have a chance to whiten out further. New forum does not play nice with iPads :(. In dogs I have groomed (dog groomer 10 years) you often find areas of either biscuit color or gray close to the body, which I assume are where a color area faded out. That still fits gray. As it removes the color from the tip of the hair shaft. That is why gray doesn't show well in short haired breeds. There just isn't enough hair length for it to manifest. It's interesting though that most crossbreds don't gray. I wonder if many of them just don't have long enough hair. Crias, I sent you a PM for more information about the Ipad. Most if the dogs that I have seen have medium to long coats. I don't think it is gray. If ou search Great Bernese (Pyr x Bernese Mtn dog mix) you will see that most are colored and certainly not short coated. The ones I have seen that are sable and white as puppies do not seem to fade as they age. Dogs colored like this one (sable and white) were the most common, though pups colored like Berners also occur semi-often. I know gray exists in A Kerry Blue Terriers. Have you ever groomed one of those Crias? I'm just wondering how their actual coat length (if the hair is stretched out) compares to the great pyrenees crosses? The coat is of course very different than a Kerry Blue in type and texture. The Pyr mixes do vary from being similar in length and density to a purebred Pyr (6"-8" or so on the body with much longer feathers and chest), some have shorter body coat (3"-4") still with long feathers,and a few have coarse short German shepherd type coat. Kerry Blue of course continue to grow vs the more set length of the double coated breeds. A grown out Kerry Blue can be quite long so I don't know how long the coat has to be before you see gray? Groomed up Kerry's are 3-6" depending on the part of the body and if show or pet. What does a gray Kerry look like? Is it just a blue, or do they turn white like a gray horse? Do they retain color at the skin? Is gray age progressive in dogs? Is the dog on the left a gray? Yes the dog on the left is gray. Gray is age progressive and works by taking color away from the tips of the hair first. So, as the dog ages, the part of the hair with color gets narrower and narrower until the only color left is near to the body. It is thought that gray may be present in some short haired breeds but does not express because a long coat is required. For a reason not understood if the dog has a black mask the black mask retains color as you can see on the dog above. Gray only effects black pigment so ee dogs or dogs that are mostly yellow or red will not gray. Is the above photo yours? If so I'd like to add it to the gallery. I think I only have one example of a gray dog. No sorry - not my photo :(. No sorry - not my photo :(. Just pulled it from google. I noticed I hadn't updated any pictures of my pup in a while, these are a little older, from August 10th. You can really see his color is much lighter than when I got him. He is now much taller than the white bulldog. This is a beautiful dog, what breed is he? I think that dog is a pyr bernese mix? My Malamute became progressively lighter as he grew older, but I think that's just the black hairs separating. I'd be interested to know what causes this in Pyrs. My brother has a Pyr X LGD who is sable with a black mask and dark red pigment. 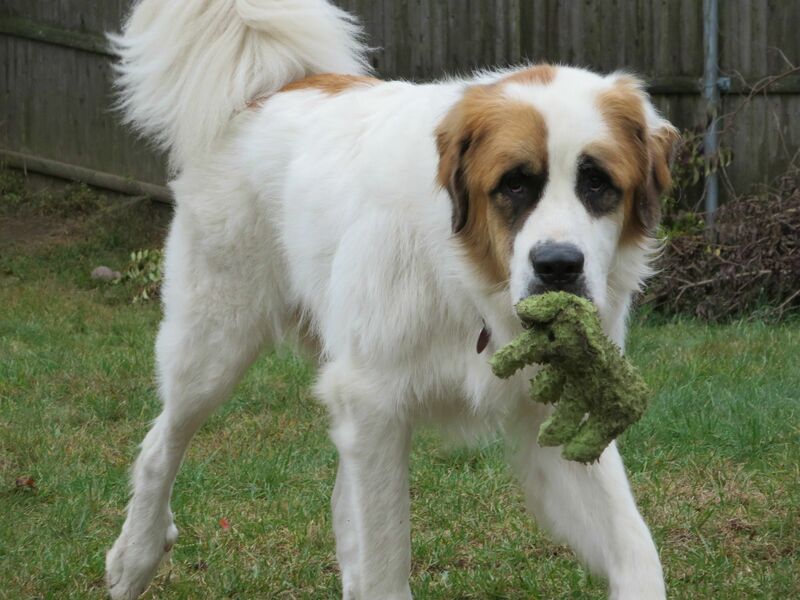 Many people mistake him for a Saint Bernard because of it.